Mr. George Orwell’s dystopian novel ‘1984’ said it best when he claimed that although you are watching the television, the television is also watching you. Fast forward to 2018, and once again the bosses of those big tech data companies that make money out of watching you are being called to Capitol Hill to answer questions about their business model. 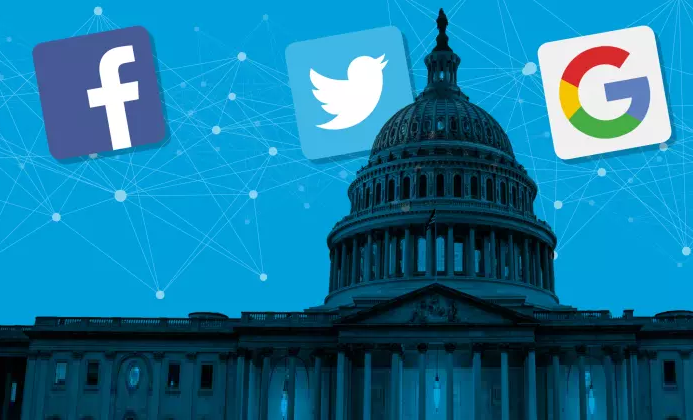 Although the alleged Russian collusion to influence the 2016 Presidential Elections will certainly be brought up again, this time around most of it will be about whether or not Twitter, Facebook, and Google prefer leftwing over the rightwing news. But make no mistake, most of it is for show only and to allow politicians to get themselves seen on TV (Midterms are coming up). Big data at this point couldn’t care much less about what you think of them. Facebook and Google that is, because Twitter indeed might find itself in a ‘spot of trouble’. Mr. Zuckerberg, CEO of Facebook decided to send his second in command Ms. Sheryl Sandberg, who, just like him, will be avoiding answering every possible question with a straightforward yes or no, will remind everyone that she’s lost her husband and will probably trounce the congressmen and woman as being the tech support engineer to a grandfather unknowing how to turn on his computer (much like the first inquiries of Mr. Zuckerberg both in the US and Europe looked). Google CEO Mr. Sundar Pinchai decided not to bother showing up and is sending a lawyer, clearly demonstrating to US politicians that his company has become by now ‘too big to fail’ and he simply couldn’t care less about what they want to know. The real problems should arise for Mr. Jack Dorsey, CEO of Twitter, who has been going on a damage control mission over the past three weeks. At first, he admitted (on CNN) that his outfit ‘leaned left’ and in the past week all of a sudden the Quality Filter installed to lessen the effect of conservative voices had disappeared (remains to be seen whether it will be reinstalled next week of course). However, Mr. Dorsey’s Twitter, unlike Facebook or Google, does not have a winning business strategy or even a monopoly. When President Trump highlighted the censoring of conservative voices on his platform recently, many fled to Gab.ai or 8chan to see what they had to offer, and many have since stayed there. Related coverage: <a href="https://thegoldwater.com/news/35880-If-Trump-Leaves-Twitter-for-Another-Platform-Twitter-Is-Done-Said-Trump-s-Campaign-Manager ">If Trump leaves Twitter, it is done for Twitter</a>. And then Mr. Brad Parscale, US President Donald Trump's 2020 campaign manager put the nail in the coffin last week for Mr. Dorsey, claiming that ‘If Trump leaves Twitter, the platform is done’. All the while as this happens, most of the US public keeps clicking away on Google, Facebook, and Twitter. And thus the Big Data algorithms continue to learn everything there is to know about you. And perhaps, depending on where they can make the most money, they will temporarily lean left or right, just as long as you don’t interfere with them, they will eventually become the true rulers of you.